My husband has every card I’ve ever given him. I mean every single one. Like since 1984. He also has saved every note our daughters have penned. They are neatly organized in his bedside table. I have a whole stack of love letters I saved from him during college. Other than that I’m just not emotionally attached to cards. Which is funny because I love words and my husband is a man of very few words. I can, however, tell you about every piece of jewelry, china, silver, and artwork my husband has given me. I can recall when it was given and where. I can recollect that period of time as if it were capsuled just for me. Some pieces have strong emotions attached to them. Seasons of passion and seasons of pain. To me, that’s what makes them priceless. That’s what illustrates our story. When we were dating we spent a lot of weekends on his family farm. Being a man of few words he loved to drive the fields and just observe. We would drive through soy bean, tobacco, and cotton fields in his grandfathers 1964 pickup truck. The floor boards on the passenger side were rusted. You could see the eastern North Carolina sandy soil beneath you. Tobacco leaves swishing up through the floor as we bumped along in that old three on the tree truck. One of the things I love about my husband to this very day is that he taught me to be still. To observe. To watch. To appreciate the flatlands we live in. To see the story in the land. Architecture in tobacco barns. To take in the sunset in silence. To take notice of all the beauty that surrounds us. I believe that God used my husband to set the stage for me to be able to see Gods glory much later in our marriage. I wish I could articulate to our daughters just what love and marriage truly mean. Our daughters are at the age of being bridesmaids and attending the weddings of their friends. The beautiful dresses, gorgeous rings, and extravagant receptions. But do they truly comprehend what the joining of those two young people mean? If it was all meant to be perfect then we wouldn’t need Him. 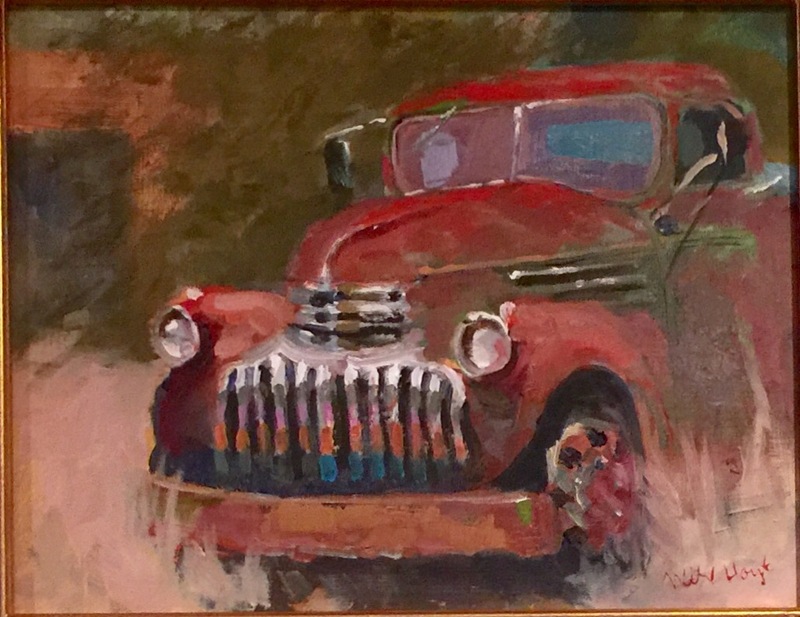 My husband gave me a beautiful oil painting of an old pickup truck for Valentines Day. The artist had entitled it “At Rest”. Few things have moved me like this painting. It reminds me of the farm, young love, and all the bumps in the road over the past 27 years of marriage. The epiphany that through it all we are finally at rest with one another. We no longer expect the other to fill that empty hole. We know, now, that only Jesus Christ can truly satisfy our souls. That our spouse was never intended to be our god. I love my husband more than words could ever adequately describe. He is my very best friend. My confidant. My partner. But he alone can not complete me. He compliments me. And hopefully our earthly love is a preparation for the eternal love that we have in Christ.